The market jumped on April 5 after consolidating for a few sessions, driven by banking and financials and metals stocks. Technology stocks also participated in the run ahead of TCS and Infosys’ March quarter earnings scheduled on April 12. On April 5, the 30-share BSE Sensex climbed 177.51 points to 38,862.23 while the Nifty50 rose 67.95 points to 11,665.95 and formed bullish candle which resembles a ‘Spinning Top’ kind of formation on daily charts. Nifty made a new life-time high of 11,761 during the week just eclipsing the previous high of 11,760 but consolidated for the most part of the week with buying interest on declines. The index rose 0.4 percent and formed ‘Long Legged Doji’ kind of pattern on the weekly scale. US stocks rose on Friday, boosted by better-than-expected job growth in March, which eased concerns of an economic slowdown that have periodically roiled financial markets over the past year. The gains put the benchmark S&P 500 on track to close higher for seven trading days in a row, which would be its longest winning streak since October 2017. 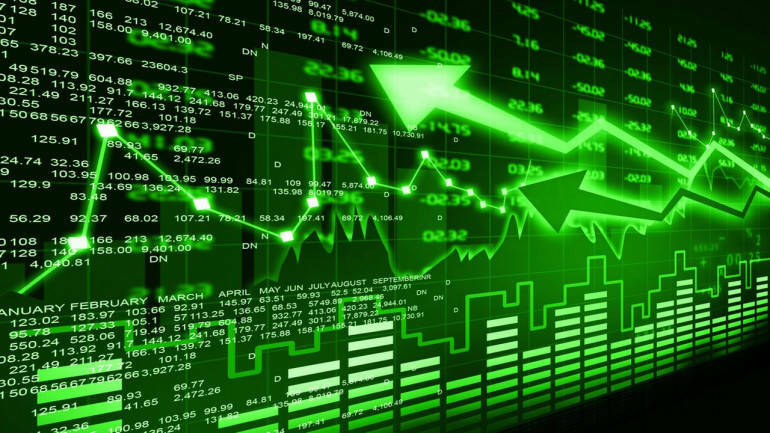 The Dow Jones Industrial Average rose 25.29 points, or 0.1 percent, to 26,409.92, the S&P 500 gained 10.35 points, or 0.36 percent, to 2,889.74, and the Nasdaq Composite added 38.55 points, or 0.49 percent, to 7,930.33. Asian shares edged higher on Monday as investors cheered a much-needed rebound in US payrolls, while looking forward to more policy stimulus in China. MSCI’s broadest index of Asia-Pacific shares outside Japan gained 0.1 percent to hold just below its recent seven-month top. Japan’s Nikkei rose 0.2 percent to its highest of the year so far, while South Korea and Australia both made modest gains. E-Mini futures for the S&P 500 inched up 0.03 percent. Trends on SGX Nifty indicate a flat to positive opening for the broader index in India, a rise of 11 points or 0.09 percent. Nifty futures were trading around 11,784-level on the Singaporean Exchange. Oil prices rose to five-month highs on Monday, driven up by OPEC’s ongoing supply cuts, US sanctions against Iran and Venezuela and healthy US jobs data. International benchmark Brent futures were at USD 70.69 per barrel at 0047 GMT on Monday, up 35 cents, or 0.5 percent from their last close. US West Texas Intermediate (WTI) crude were up 35 cents, or 0.6 percent, at USD 63.43 per barrel. While many analysts expect another rate cut in the June policy, Goldman Sachs on Friday said the Reserve Bank is likely to wait to see the impact of the past two consecutive rate actions and assess the macroeconomic factors following general elections and a clearer picture on the monsoons to emerge. The Wall Street brokerage goes one step further saying it expects two rate hikes in calendar 2020-a 25 bps each in Q1 and in the Q2. In a 4:2 majority vote, the central bank cut the repo rate to 6 percent from 6.25 citing the need to support growth that has lost momentum of late in the first bi-monthly monetary policy announced Thursday. The rupee skidded 6 paise to finish at 69.23 per US dollar Friday, largely owing to increasing demand for the greenback from importers. Forex traders said strengthening of the dollar against key currencies overseas also kept the rupee under pressure, though persistent foreign fund inflows restricted the fall. At the Interbank Foreign Exchange (forex) market, the domestic unit opened at 69.11. It moved in a range of 69.33 to 69.05 before finally ending at 69.23, down 6 paise over its previous close. A cornered Theresa May issued a “stark” warning to the warring factions within the UK Parliament that the choice was between agreeing on a withdrawal agreement or risk no Brexit at all. In her latest statement from Downing Street on April 6 evening, the British Prime Minister sought to defend her move to reach out to Opposition Labour Party leader Jeremy Corbyn in an attempt to break the ongoing parliamentary deadlock over Britain’s impending exit from the European Union (EU). The maiden dollar-rupee swap conducted by the central bank last week helped the country’s foreign exchange reserves swell by a healthy USD 5.237 billion to USD 411.905 billion in the week to March 29, RBI data showed Friday. In the previous week, the reserves had increased by USD 1.029 billion to USD 406.667 billion. Foreign currency assets, a major component of the overall reserves, swelled by USD 5.248 billion to USD 384.053 billion in the reporting week. In a bid to infuse liquidity into the system, the Reserve Bank had on March 26 conducted a USD 5 billion dollar-rupee swap auction, which received bids for over USD 16 billion. The initial public offering (IPO) of diagnostic chain Metropolis Healthcare was subscribed 5.83 times on the final day of the bidding Friday. The Rs 1,200-crore IPO received bids for 4.47 crore shares as against 76.61 lakh shares on offer, according to the latest data on the National Stock Exchange. The category reserved for institutional investors was subscribed 8.88 times, while non-institutional investors segment was subscribed by 3.03 times. The retail investor category was subscribed 2.17 times, according to sources. The price range for the IPO with a total issue size of around 1.36 crore shares was fixed at Rs 887-880 per share. The initial public offering (IPO) of wires and cables manufacturer Polycab India was subscribed 71 percent on the first day of bidding on Friday. The company plans to raise around Rs 1,345 crore through a mix of fresh issue of equity shares and an offer for sale. The IPO received bids for 1.25 crore shares as against the total issue size of 1.76 crore shares, according to the latest data on the National Stock Exchange. The price band of the issue, which will close on April 9, is fixed at Rs 533-538 per equity share. It includes Rs 400 crore of fresh issue and an offer for sale (OFS) of 1.75 crore shares of face value of Rs 10 apiece. For April 8, Adani Power, DHFL, IDBI Bank, Jet Airways and Reliance Power are present in this list.